My role in HMRC is to develop the overarching departmental Digital Strategy working for the interim Digital director Brigid McBride. I wanted to share with you what we are doing to ensure we provide support for those who rarely or have never gone online due to their age, ability or income as part of the work we are doing to deliver on our aim to develop digital services for HMRC that are so good that everyone prefers to use them. But first have a look at the strategy and tell us what else you would like to include HMRC Digital Strategy, I would welcome your feedback as I am currently working on refreshing it. We know that there will always be customers who cannot use or struggle to use digital services and our continued growth and development cannot be at the expense of those customers. We need to do all we can to ensure that they are not excluded and our Assisted Digital Strategy will define our approach and commitment to making this a reality. What does Assisted Digital mean? Making available different routes into our services for those who are unable to access them, even with help. Signposting customers to skills training, availability of free and low-cost digital devices (to enable them to get internet access) and continuing to support initiatives that promote digital inclusion. Working with third parties to ensure our online products are as customer-friendly as they can be, and to offer support to customers who might still require help. While we will continue to support customers by inputting data on their behalf (or enabling an intermediary to do so), good assisted digital provision should encourage and equip customers with the necessary skills eventually to self-serve. 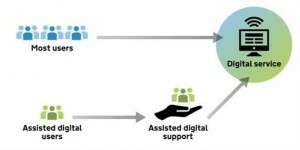 As more customers develop digital skills and begin to experience the benefits that digital channels offer (speed, security and certainty), we will be able to reduce the resources allocated to alternative channels and focus greater resource and efforts on helping those who really cannot access digital services even with help. It is worth clarifying that Assisted Digital is different to Digital Inclusion. The agenda for Digital Inclusion is far wider and aims to develop more generally the digital skills and capability for both businesses and individuals with a view towards benefiting the wider economy. I will post more information about the strategy as it develops.